The Typecast blog is written by myself, Nickie O'Hara - wife to one, Mum to three and Nana to three (yes, really!). I live in Lancashire in the North West of England. I co-lead and co-manage a running group which is part of the 5K GroupRun programme in Blackburn. I also enjoy writing and crochet to wind down. Please do not hesitate to request my media pack which details charges and conditions for sponsored/paid content and advertising. To find out more about my ongoing innovative projects, my freelance work and my digital consultancy services please visit www.nickieohara.co.uk. The Typecast blog has been live since July 2009 and I have been blogging and using online forums and newsgroups since 2002. I am currently a lifestyle blogger for the Metro writing articles focused towards parents and grandparents. I am founder of the #FitbitchesMOVEment which promotes and motivates fitness for women of all shapes and sizes, and I also write a geek/tech blog called Geekalicious. 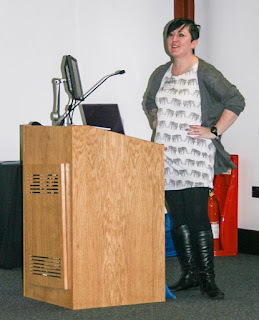 I have fronted public speaking sessions and focus groups at blogger conferences including BlogOn MSI in Manchester and BritMums in London. I have a prominent presence within social media platforms, especially on Twitter when you can often find me spending my Friday nights hosting the 'Friday Twiz'! I currently produce a running podcast called The First 10 Minutes Are The Worst and I produced and hosted a radio panel show on Preston FM called The Big Cheese. Please contact me for more details about writing and publishing features, reviews and commercial content. You may also like to have a look at my content policies. I created a guest-posting series called "Cancer - Your Story" to break the taboos regarding cancer. I am also one of the founders and organisers of the campaign "Blognonymous". I have contributed material to well known websites and blogzines such as The Huffington Post and The High Tea Cast (now known as Unsorry Magazine). I have had articles featured on various blogs in the parenting and writing communities and have written for national publications including Flying Start Magazine, Electrical Trade Magazine and Plumbing Trade Magazine. This blog was a Top 20 Teads Lifestyle and Parenting Blogs and has been described as influential by numerous well-known brands and sources such as Mumsnet, Netmums, Cision and Voucher Codes. so if you really need to, you'll know how to find me"
"Those three words, are said too much, but not enough"
"I know I'm gonna die so my revenge is living well"
"She's all sparkly. She looks like a holiday"
Disclaimer All content on these pages is the intellectual property of the author, unless otherwise stated, and may not be used or reproduced under any circumstances without permission.